Sparkling wine plus orange juice not only is one of today´s most favorite mixed drinks but an absolute classic at weddings, receptions, birthdays, in casinos or just simply whenever there´s something to celebrate. All good reasons to inspire us to our new mixed drink SECCO+ ORANGE, yet with a decisive diff erence: here the orange juice has already been included! Superb German wine together with 43 % juice of sun-ripened oranges builds the ingredients for this perfect mix containing 5.5 % alcohol. And both grant SECCO+ ORANGE its characteristic tangy and stimulating fruit flavor. 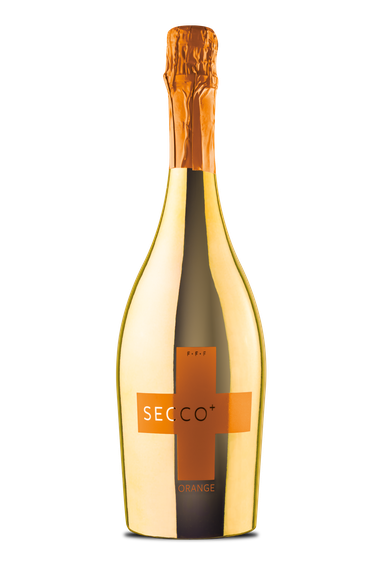 Indulge yourself in the sparkling harmonic taste experience of SECCO+ ORANGE from the first to the last drop. Spare the trouble of buying all different sparkling wine and orange juice bottles as well as its tedious mixing. Now you only need to simply open a bottle of SECCO+ ORANGE, pour it in and relish joyfully! SECCO+ ORANGE is available in the gilded 750 ml bottle, the compact 200 ml bottle or as the 250 ml slimline can. You´ve got the choice – whether as a noble gift, a true kick of freshness at brunch or as “to go” for your small thirst on the way.